Belinda Post is no stranger to having an audience. 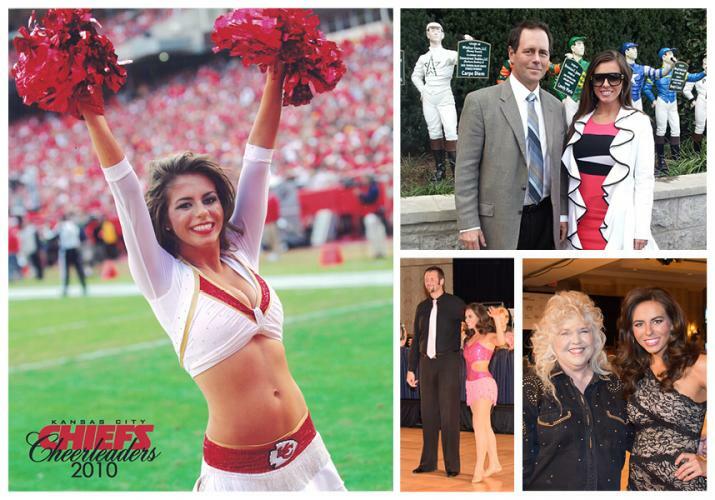 Before she started her career in television, she was an NFL Cheerleader for the Kansas City Chiefs. From 2010-2011 she was on the sidelines performing before a crowd of 90,000 screaming fans with a close knit group of women she likens to sorority sisters. “You work hard, sweat, memorize about four routines per game and put in a lot of extra time,” she said. But she says it was worth it to see and hear that crowd plus get something extra. “I think the fellowship is something most people wouldn’t expect. Our practices were rigorous, but we’re always cheering each other on, trying to lift each other up. I think its so important for women to support each other,” Post said. “A studio kid is anyone who most Monday-Fridays is in a dance studio,” she explained. “Growing up, most of my time was spent in a dance studio, on a colored line, learning routines and technique.” She credits that time as good preparation for her career in television. Post earned a Bachelor of Arts with honors in theater and dance from Kansas State University as well as a minor in French. She was able to graduate in just three years at the age of 20. It was a busy time. Post was the Wildcat Twirler for The Pride, Kansas State University’s Marching Band. Along with a laundry list of extracurricular activities, she was involved in the dance program and was in a show nearly every semester. “Between band, rehearsals, game days, dance shows and my sorority, Kappa Alpha Theta, I was always exhausted, but I had the time of my life,” she said. After graduating, she started her professional dance career. Post danced for Kansas City for Kacico Contemporary Dance and Reach: A Movement Collective. “I danced for both companies simultaneously; one was contemporary and the other modern. I grew up taking ballet, tap, jazz, pom and baton. More than anything, that taught me character,” Post said. While she is versed in and loves many styles of dance, Post says she excels at what she describes as “girly jazz.” Her talent and love for children also prompted her to teach. “I was a dance teacher for many years at my mom’s studio. I also started dance programs at three community centers. I think when working with kids you do a lot more than teach technique, you’re also a role model and you’re impacting their lives in a positive way.” she said. It was a freelance reporting opportunity in Post’s hometown of Topeka in 2010 that had her rethinking her future. 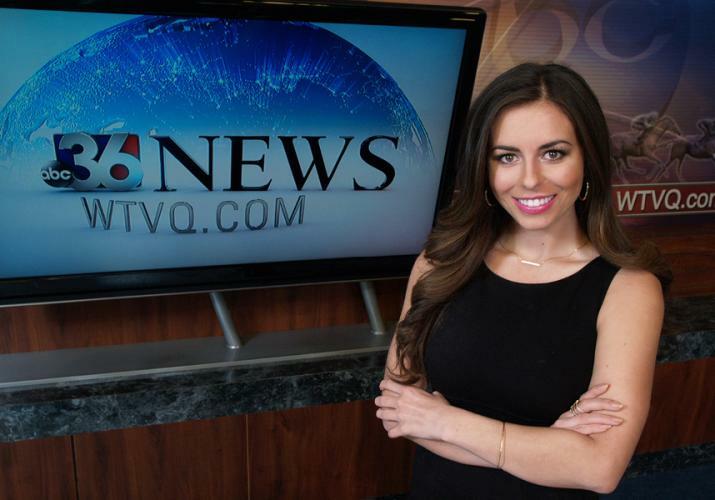 She covered human interest/feature stories a WIBW-TV. “It was a dream come true to work at the station I grew up watching and loving,” she said. Next stop, Kansas City where she was a sideline reporter for the High School Game of the Week on KSMO-TV. After that, she knew she wanted to shift her professional focus from dance to journalism. “I love telling stories, meeting new people and learning about them, so I decided to go to graduate school to hone my craft,” she said. Post landed in the Sunshine State where she studied Mass Communication at the University of Florida in Gainesville. She was a graduate teaching assistant and worked on several of the university’s broadcasts. She hosted and co-produced a long form sports journalism show on GatorVision, reported for the local NPR affiliate, and anchored and reported on the university’s cable station and PBS affiliate station. She took that experience back home during summer break and did some freelance work for KAKE News in Wichita, KS. The timing was great. It was 2012 and the Republican National Convention was taking center stage in Florida for the upcoming presidential election. She got the opportunity be a runner for ABC News. “I think that’s an example of when journalism gives you a front seat to history. Everywhere I walked it seemed there was a delegate or candidate giving a statement surrounded by journalists. There were also a lot of lobbyists and groups trying to influence policy, which is probably something a lot of people don’t expect. The sheer number of people who show up to hear politicians speak is tremendous. I’d never seen 50,000 people in an arena, unless it was for a sporting event or graduation,” Post said. Highlights of that experience included meeting Kentucky native Diane Sawyer as well as Newt Gingrich. She was paired up with ABC News Senior Political Correspondent Jon Karl one day to watch him as he worked. Post also watched as ABC’s Karen Travers did a live report. “She’s certainly a favorite of our’s at WTVQ!” With an estimated 15,000 credentialed journalists at the RNC, Post says everywhere you turned you would run into a familiar face. The experience made her realize she was headed in the right direction. “That’s why I got into this business. It’s our chance at a front row of history and to meet people we otherwise never would,” she said. With her Masters of Arts in Mass Communication with an emphasis on multimedia telecommunication from the University of Florida, Post embarked on her TV career. A visit to Lexington in 2014 caught her attention. “I saw the biggest, most beautiful horse I had ever seen. The icing on the cake was when I saw the sun set on the Bluegrass; from then on, I knew this would be home.” A couple months later, it was. “WTVQ is the perfect place for me right now because I get a lot of experience in different roles, working on different skills. My managers give me the freedom to decide what goes into my show, which I strive to make engaging,” Post said. She anchors the 10pm news, Monday-Friday on the station’s digital channel, 36.2, MyKentuckyTV. “I want it to be news that matters to you, that impacts your family, work, pocketbook and ultimately, your life. I love the show because it also includes entertainment, sports and what’s trending online. Overall, it covers everything you need in a newscast,” she said. When Post is not working she enjoys volunteering. She is a member of Toastmasters International and the Lions Club service organization. “For me there’s nothing better than helping someone else. I was the top solo fundraiser for Northeast Kansas for the Muscular Dystrophy Association for 18 consecutive years, raising over $85,000 for MDA,” she said. Post has also organized grass root fundraisers for the Children’s Miracle Network, victims of the Joplin and Reading tornados, tsunami victims, and a children’s school in Ghana. Right now she sits on the Miss Topeka board, a former two-time winner of the pageant herself. She went on to place 1st Runner Up at the Miss Kansas Pageant, winning evening gown. She made the Top Five in her other appearances at Miss Kansas, winning talent and swimsuit three times each. During football season, you’re guaranteed to find Post watching a game every weekend. While she is a huge fan of the Chiefs and Royals, she is enjoying the opportunity to follow her new hometown teams. “I love sports and going to UK football and basketball games as well as Lexington Legends games. I also watch the Bengals every week,” she said. Whether its heading downtown for the latest attraction, catching a show at The Lexington Opera House, or dining at one the increasing number of great local restaurants, Post likes to get out and meet new people. “I think of myself as outgoing and I thrive when I’m around others. Being a dancer and a performer, you gain energy from the people you’re around,” she said.